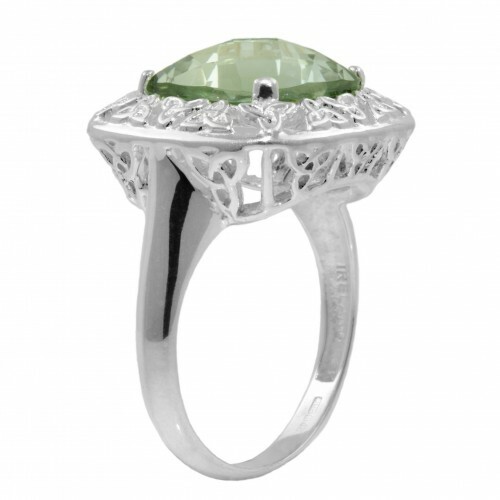 A stunning briolette cut Green Amethyst Stone that stands tall and proud on the finger. A filagree lacework of trinity knots weave around the top and gallery of the ring, creating a delicate lattice of open celtic knotwork that is simply breathtaking. 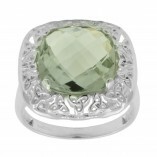 This ring has oodles of presence, and thats before you even notice the intense light and sparkle of the green amethyst. 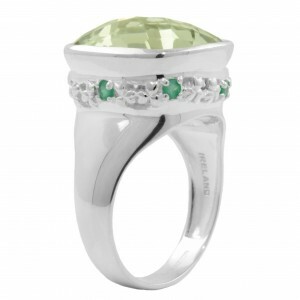 The briolette cut means it is faceted top and bottom, maximizing the life and sparkle of the gemstone.